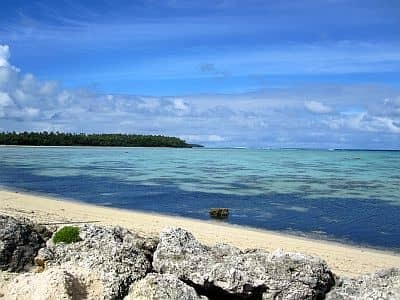 In Tonga, an Oceanian archipelago lying south of the Equator, the climate is tropical, influenced by the trade winds, with a hot, humid, and rainy season from December to April and a cool and relatively dry season from June to October. On the northernmost islands, May and November are hot and rainy as well, and the temperature is high even in the coolest months; on the contrary, on the southern islands, May and November fall within the relatively dry season, while the period from June to September is pretty cool. However, even in the relatively dry season, brief showers and thunderstorms may occur throughout the country, which fortunately do not reduce too much the sunshine hours. Generally, the rainiest month is March. On the northernmost islands (zone 1 on the map), which lie at a latitude of about 15 degrees south (Niuafo'ou, Niuatoputapu, and Tafahi), the climate is hot and humid all year round, so we can speak of equatorial climate. Between the hottest months (February and March) and the least hot months (July and August), the difference is little: highs range from 31 °C to 29 °C (88 °F to 84 °F). Here are the average temperatures of Niuafo'ou. Precipitation is abundant and exceeds 2,300 millimeters (90 inches) per year, with a rainier period from November to April, when it exceeds 200 mm (8 in) per month, two transitional months, May and October, with 170/180 mm (6.7/7.1 in) of rain per month, and a less rainy period from June to September, when still 100/140 mm (4/5.5 in) of rain fall per month. Here is the average precipitation. Therefore, the best period in this area is from June to September, since it is the least rainy, and albeit slightly, the least hot. Further south, in Vava'u and the surrounding islets (2 on the map), annual rainfall decreases to 2,100 mm (83 in), and the temperature in the coolest months drops a bit as well: highs in July, August, and September are around 27 °C (81 °F), though it's still warm enough for a beach holiday, so, here too, the best period is from June to September, when, however, the rains are still around 100/120 mm (4/4.7 in) per month. Here are the average temperatures in Vava'u. Here as in the northernmost islands, sea is warm enough to swim in all year round, in fact, it reaches a minimum of 25 °C (77 °F) in August and September. 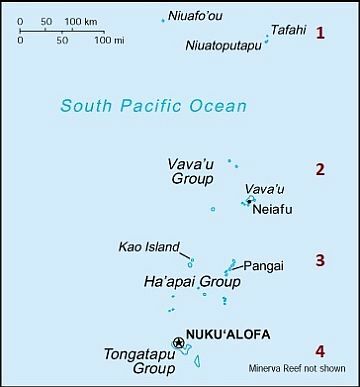 More to the south, we find the Ha'apai group (3 on the map), made up of islands such as Lifuka, Foa, and Ha'ano. Here, rainfall drops to around 1,600 mm (63 in) per year, at least on the flat islands, while there are also volcanic islands, such as Kao, with inland slopes that enhance the formation of thunderstorm clouds. Here is the average precipitation in Lifuka. As you can see, there is no real dry season, but the rains are at an acceptable level from May to November. Highs in Lifuka range from 30 °C (86 °F) in February and March to 26 °C (79 °F) between June and September. Being that the relatively dry season is a little longer, the best time here is from May to October. Here are the average temperatures. In the far south, we finally find the groups of Tongatapu and 'Eua (4 on the map). In Tongatapu, where Nuku'alofa is located, precipitation is still around 1,600/1,700 mm (63/67 in) per year, but owing to the more southern position (the group is located at a latitude of 21 degrees south), winter is a quite cool season: highs from June to September are around to 24/25 °C (75/77 °F), and sometimes, cold air masses car arrive here, lowering the temperature by a few degrees. Here are the average temperatures of Nuku'alofa, the capital. On the southernmost islands, the sea temperature also decreases by a few degrees in the southern winter, dropping to 23 °C (73 °F) in August and September, so it remains acceptable but not so warm. Given that the minimum temperature remains generally high, around 18/20 °C (64/68 °F), the conditions remain usually acceptable for a beach holiday, but those who are sensitive to cold, could feel a bit cool. So, on these southernmost islands of Tonga, you can choose the months of May, October, and November, when daytime temperatures are a little higher, around 26/28 °C (79/82 °F). The islands of Tonga are in the path of tropical cyclones. Cyclones are usually formed from November to mid-May, though they are most likely from late December to early April. The following are some intense cyclones that hit the Tongan archipelago in the past few decades: Ron in January 1998, Waka in December 2001, Heta in January 2004, and Gita in February 2018. The best time to travel to Tonga is from June to September on the northern islands, down to the Vava'u group inclusive, from May to October in the Ha'apai group, and finally, it corresponds to the months of May, October and November in the southern group of Tongatapu. Anyway, considering that, albeit rarely, cyclones may also occur in November and in the first half of May, for safety, you can exclude these periods, even where they fall within the best ones. For the northernmost islands, all year round, bring tropics-friendly, loose-fitting clothing, a sun hat, a scarf for the breeze, a light sweatshirt for the evening, and a light raincoat or umbrella. In winter (June to August), pack light clothes for the day, a scarf for the breeze, a sweatshirt for the evening, and possibly a light jacket for the southern islands; a light raincoat or umbrella. When going to the reef, you can bring snorkeling equipment, including water shoes or rubber-soled shoes. In summer (December to February), pack tropics-friendly, loose-fitting clothing, a sun hat, a scarf for the breeze, a light sweatshirt for the evening, and a light raincoat or umbrella.